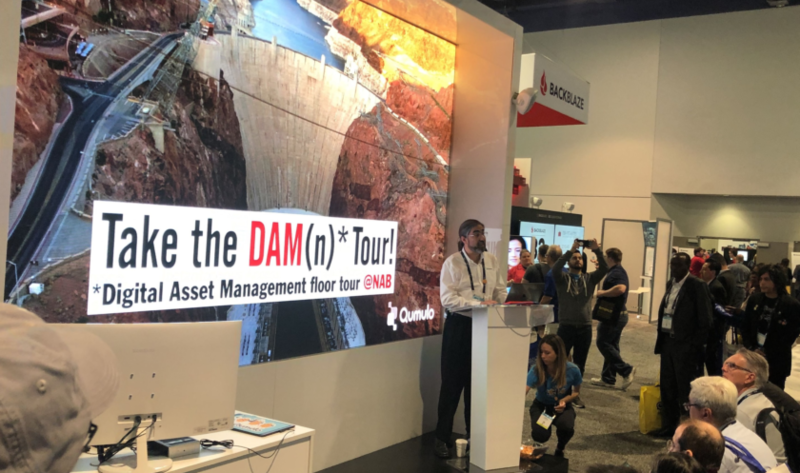 LAS VEGAS — Several Media & Entertainment Services Alliance (MESA) members got to tout their latest digital asset management (DAM) technologies April 8 during the first of two DAM Tours this week. 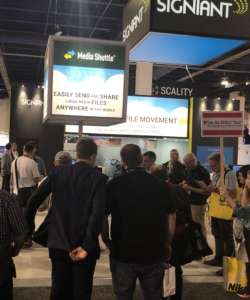 The nearly three-hour guided tour on the opening day of the NAB Show floor turned the spotlight on eight MESA member companies at their booths across the Las Vegas Convention Center. Mary Yurkovic, director of Smart Content for MESA, led a group of media and entertainment executives and content owners through the booths of Sohonet (SL14205), Digital Bedrock (SL10130), Caringo (SL13310), Qumulo (SL12111), Signiant (SL10216), Prime Focus Technologies (SL9605), SHIFT (SL8705) and Sony (C11001). Each stop featured dedicated speakers sharing their latest asset management-related technologies. 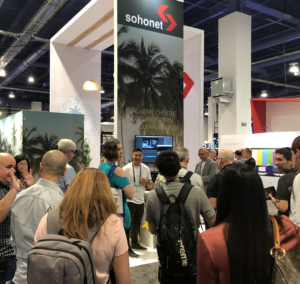 At the Sohonet booth, Drew Law, customer success manager at the company, spotlighted the real-time creative collaboration provided by the company’s ClearView Flex platform. Sohonet noted before the show that ClearView Flex “enables key creatives [and] production executives to review and approve live, encrypted video streams from any source, remotely” on their tablet or PC. Law demonstrated during the DAM Tour how – whether you’re looking to review dailies, remote color grade or view live feeds direct from the camera — ClearView Flex provides you with the security and flexibility to collaborate with your teams remotely and in real-time, from anywhere in the world and on any device. At the Digital Bedrock booth, Linda Tadic, that company’s CEO and founder, told attendees how her company’s managed, secure data preservation services intelligently preserve big data, combining object storage methodologies to unstructured data while securely storing assets offline. 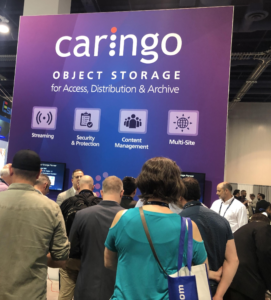 At Caringo’s booth, Ben Canter, VP of sales, explained to Dam Tour attendees how Caringo’s content-focused storage platform Swarm provides organizations secure access, distribution and long-term retention. Swarm, among its many benefits, enables “global distribution of your assets” while keeping that content secure, he said. With both S3 and NFS access to the same content, Swarm protects files at exabyte scale and enables streaming and longtail video-on-demand, centralized backup, distribution for collaboration and tape replacement, according to Caringo. Since last year’s NAB, Caringo also introduced a simple way for organizations to get started using Swarm by offering it on the Swarm Single Server Appliance – a new solution being demonstrated by the company this week that was designed to meet the needs of small- to medium-sized content-driven organizations. The many benefits of Qumulo Cloud Rendering and the new CloudStudio and CloudContinuity were then touted by Michael Bott, principal systems engineer at that company. Just ahead of NAB, Qumulo announced a significant expansion of its cloud portfolio, including the introduction of two new products – Qumulo CloudStudio and Qumulo CloudContinuity – as well as support for Qumulo’s cloud-native, distributed hybrid file system on the Google Cloud Platform (GCP). At the Signiant booth, Mike Nash, that company’s director of product management, highlighted the benefits of using his company’s widely-deployed Media Shuttle solution that is now used by more than 400,000 professionals to send and share large files around the world. At the Prime Focus Technologies booth, Lior Berezinski, director, pre-sales engineer at that company, spotlighted his company’s latest solutions, including Vision Cloud, a host of artificial intelligence (AI)-led micro services that are ready-to-deploy, offering automation and data to accelerate the adoption of AI within specific media and entertainment business use cases. 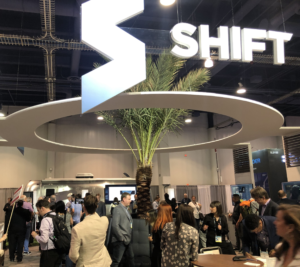 The new SHIFT platform was then touted by Jared Vincenti, that company’s VP of product. That was followed by a detailed explanation of the latest Sony Intelligent Media Services offerings by Dom Miuccio, senior sales support engineer for Media Backbone/Archive Solutions at Sony Professional Solutions of Americas (PSA), and Michael Potts, senior director of customer success and services at Sony Media Cloud Services, that concluded the Dam Tour. Unlike last year, there were few jokes about the name of the tour, but attendees were still told the booth number for the next stop if they wanted to get there on their own or couldn’t keep up fast enough to follow the DAM signs.